Next week all items registered for the craft exhibits must be dropped off at the Tulsa State Fair. 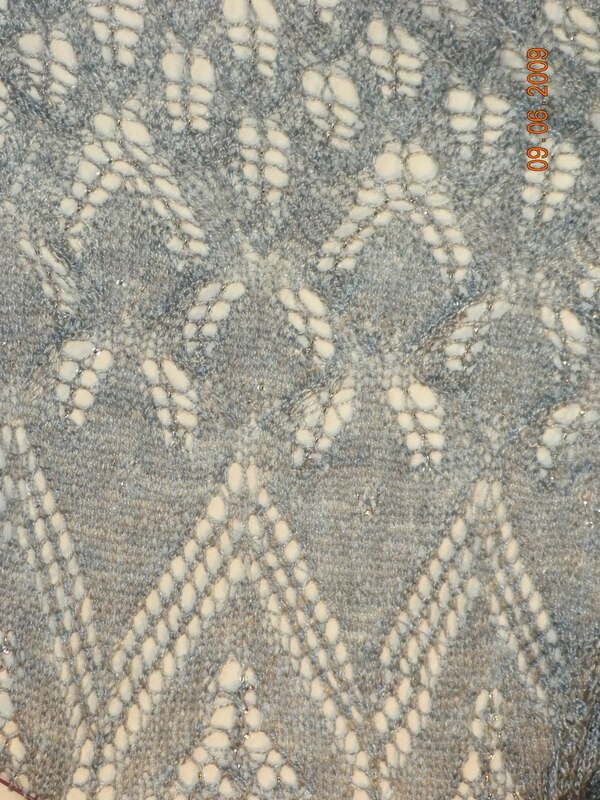 Since we’ll be in Winfield, Kansas at the Walnut Valley Guitar Festival a kind knitter named QuilterKat has agreed to take my Blue Silk Aeolian to the fairgrounds to deliver along with her fair entries. She’s a good person, that QuilterKat. Of course, this means I must have the shawl to Kat before we leave for Kansas on Wednesday. I’ve been working hard each evening knitting my little heart out. Bead – knit – bead – knitknitknit…. 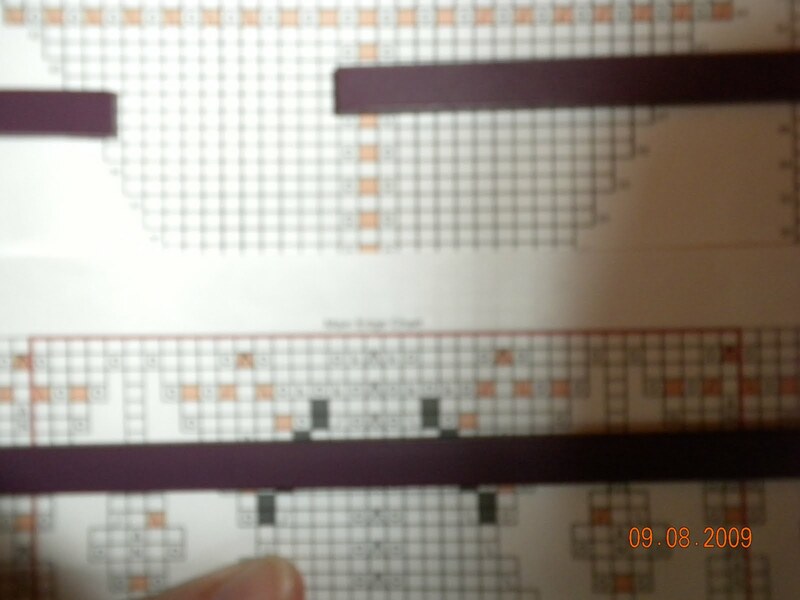 A few moments ago I finished row 41 of the Edging Chart. Boy did I feel good! Yes – did. When knitting lace I’m very focused especially if beads are involved. Don’t look at the next row I tell myself – concentrate on what your doing. 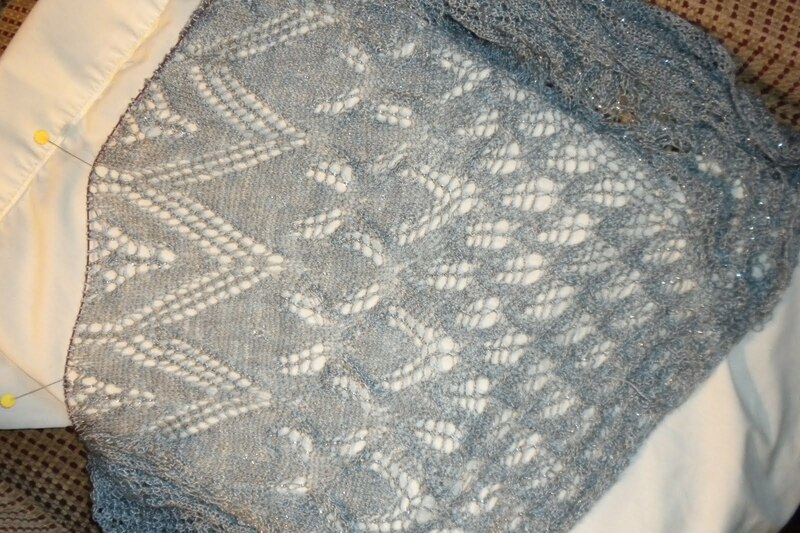 Every even numbered row is simple – purl all stitches except the three edging stitches on each end. Simple. There are now about forty-eleven stitches on the needle. I refuse to count until I hit the last purl row – which happens to be row 46. See I should feel good right? When I finished row 41 I allowed myself to look at 43. Almost every single stitch is beaded on row 43. See those orange squares? Beads. Yes I know it’s not a good photo. (I’m having a panic these things happen when panic makes everything shaky.) Did I mention how many stitches are on the needle? Forty-eleven or realistically probably a thousand. Row 43 could end this glorious ride I’ve been on. I’ve had my knitting blinders on and remained so focused that I may not have time to bead/knit forty-eleven stitches. And I repeat – Crap! While I go have a little panic – and a bowl of Tiramisu – here’s a look at how pretty the shawl was earlier in the week.